Sports clothing brands All Kasi and Nike rank among the top most admired brands in Botswana. All Kasi clinched the title of the nation’s most favorite brand, as sportswear dominates local and international markets, a recently GeoPoll survey revealed. The survey of top ranking brands lists Botswana’s most admired brands. The findings were compiled after a nationwide survey that engaged over 500 Botswana respondents via an SMS poll. The respondents, drawn from different regions, were asked to name which three local and international brands they most admired. The repondents were also asked to rank the top brands by category with a focus on media, insurance, financial services and food and beverage. Interestingly enough, the 2012 A.T Kearney’s Global Retail Development Index (GRDI) ranked Botswana as the best new market for global retailers in Sub-Saharan Africa. The index lists countries with the highest potential and opportunity for global retailers to explore. Despite the recent proliferation of global brands in the country, especially in the clothing, food and drink space, our survey confirms that Botswana is still very loyal to its local brands. 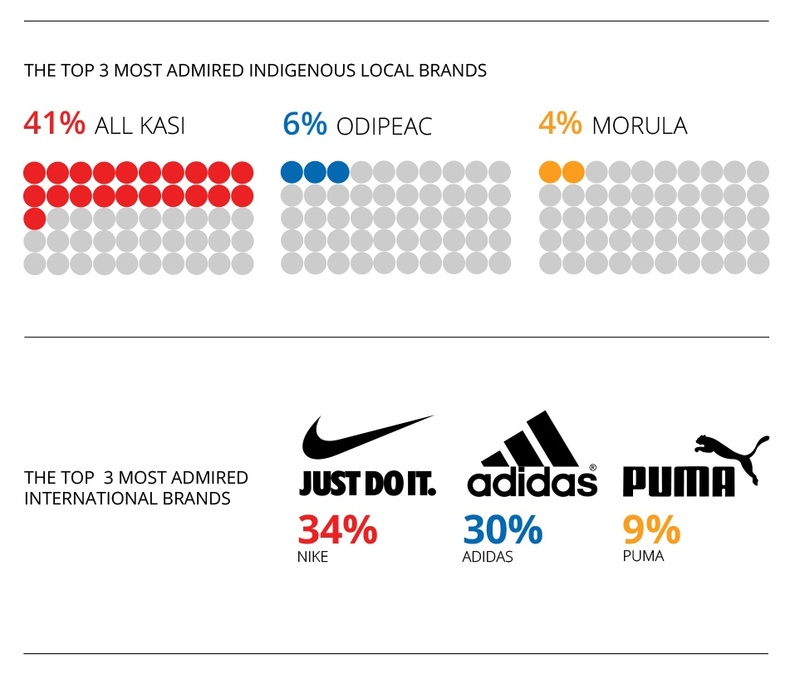 From the indigenous brand category, clothing brands rank the highest with All Kasi taking a strong lead. 43 percent of respondents hold this homegrown brand in extremely high regard ranking it as the best brand in Botswana. Local brands Odipeca and Morula, however, continue to endear the hearts of respondents who ranked these brands at six and four percent respectively. Odipeca is Botswana’s producer of casual clothing and sportswear. Divine Morula is a food processing company founded by Matilda Mpai in 2015 after acquiring funding from African Women Development Fund (AWDF). Not surprising, Nike, led the pack among internationally most admired brands with 34 percent preferring it to Adidas which follows closely at 30 percent. At a distant third is Puma with nine percent. Duma FM was ranked by respondents as their favorite media house at six percent. Supersport, a sports channel owned by South African pay TV company Multichoice, is ranked as the second most admired brand at four percent. BBE, SABC and RB2 all tie at number three with three percent. Switching gears, in the local banking, insurance and financial services sectors, our survey found First National Bank of Botswana (FNB) and Barclays to be the two most admired brands at 33 percent and 12 percent respectively. FNB is a local financial services provider most known demystifying retail banking in Botswana through its Pick ‘n Pay franchises – kiosks that offer services to the general population. Rounding out the top three in this category is Botswana Life who is the oldest and only home-grown life insurer in the country. The food and beverages category was surprisingly dominated by international brands. Coca-Cola and KFC were mentioned by the majority of respondents as their favorite with 21 percent and four percent respectively. Senn Foods, Nandos and Choppies tied at the number three spot, all with three percent. GeoPoll is now live in Botswana providing you with accurate, cost-effective, real-time information with mobile data collection. Download the full infographic for all of the survey details! And, don’t forget to sign up for our newsletter and stay up-to-date on all the latest insights and more!